The choices for gearing for a given car in the simulation are dictated by the series rules. Some cars have wide gearing options, while others, such as showroom stock or “spec” series, may only have one fixed set of gears. In general, having gears that are a little too tall is much better than having gears that are a little too short. When setting your gearing, consider the impact of the draft on the fastest straight as well as the gears used in the corners. When possible, it is generally best if the gearing is set up so you do not have to change gears during heavy cornering, as this will often upset the car. Tall gears or gearing produce higher top speeds and have a smaller numeric value, while shorter gears provide more acceleration but at the cost of lower top speeds (example: a 3.08 rear end gear is taller than a 4.11 gear). The overall gearing and speed is determined by the diameter of the rear (drive) tires and the transmission ratio times the final drive ratio. Final drive or rear end ratio – this sets the ratio in the rear end or differential and impacts the speed in all gears. Drop gear set - Drop gears are used in quick change rear ends to allow rapid gear ratio changes. 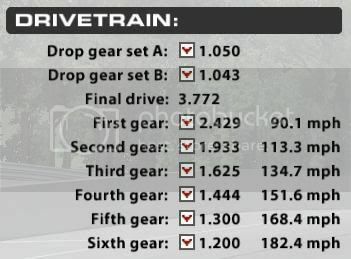 Changing either or both drop gears will change the final drive ratio. Gear set – Often used in restricted or spec series, “gear sets” may change just the final drive ratio, just the top gear ratio, some or all of the transmission ratios, or all of the above depending on the car and the gear set selected. (1) Short: Refers to a selection of gears that are best suited for quick acceleration and shorter straights. (2) Tall: Refers to gearing that is best suited for long straights and higher top speeds. (3) Oval: Gearing that is suited for the car to be running continuously at high speeds with little deviation between cornering and straight speeds. Individual transmission gears (1st, 2nd, etc.) – In more advanced race cars, this allows the selection of the desired gear ratio (from those available) for each transmission gear. Set the top gear and/or final drive ratio so you maximize the top speed of the car on the fastest straight. This is generally achieved by setting it so that the car is just under the rev limiter, but for cars where the power peak is well before the rev limit, a lower max RPM in top gear will be optimum. The idea is to use as short of a gear as you can to maximize acceleration while not limiting the top speed by hitting the rev limiter or exceeding the power band. If adjustable, set the lower transmission gears to provide the best acceleration out of the corners. In general you do this by avoiding the need for mid corner gear shifts and providing shorter steps between gears at higher speeds to make up for the increasing drag at higher speeds. This is done by reducing the rpm drop between gears as the transmission is shifted up and/or selecting gearing so that the delta max speed in gears is less at higher speeds. See the figure below to illustrate this for an Indy Car example. Short gearing may cause power oversteer in low speed corners. Using a taller first gear, more differential locking, and/or oversteer reducing suspension changes would all reduce this issue. Aerodynamic settings will have a significant effect on top speed, which may drive the need for gearing adjustments.